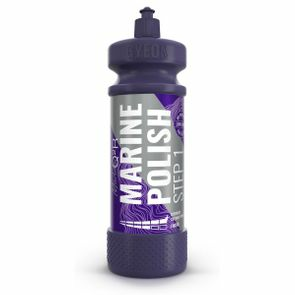 Q²R MarinePolish Step1 delivers enormous cutting power without the usual price of heavy defects. The formula is water-based and contains high-quality Japanese abrasives that allow fast and easy removal of harsh defects. No silicone or fillers make the procedure of pre-coating preparation and polish removal much faster and easier. Using the machine polisher of your choice, spread product at low RPM. Wipe off with a microfiber towel. Use an IPA to remove remaining product and inspect. If needed, repeat. Voted best boat cleaner wax! GYEON Q2 Pure 50 ml. GYEON Q2 One 50 ml.